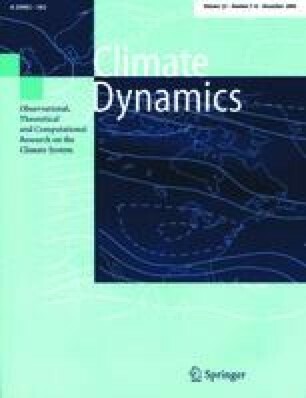 Climate changes during the next 100 years caused by anthropogenic emissions of greenhouse gases have been simulated for the Intergovernmental Panel on Climate Change Scenarios A (“business as usual”) and D (“accelerated policies”) using a coupled ocean-atmosphere general circulation model. In the global average, the near-surface temperature rises by 2.6 K in Scenario A and by 0.6 K in Scenario D. The global patterns of climate change for both IPCC scenarios and for a third step-function 2 x CO2 experiment were found to be very similar. The warming delay over the oceans is larger than found in simulations with atmospheric general circulation models coupled to mixed-layer models, leading to a more pronounced land-sea contrast and a weaker warming (and in some regions even an initial cooling) in the Southern Ocean. During the first forty years, the global warming and sea level rise due to the thermal expansion of the ocean are significantly slower than estimated previously from box-diffusion-upwelling models, but the major part of this delay can be attributed to the previous warming history prior to the start of present coupled ocean-atmosphere model integration (cold start).